Inclined plane problems involving gravity, forces of friction , moving objects etc. require vector representations of these quantities. Components are better in representing forces using rectangular system of axes since they make calculations such as the addition of forces easier. 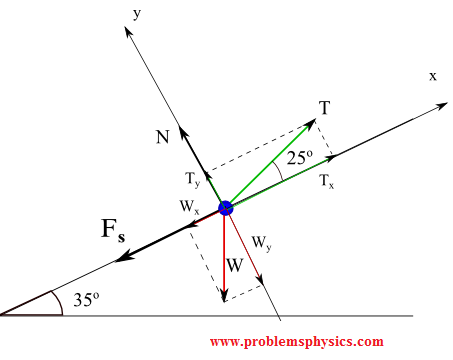 Free body diagrams are also used as well as Newton's second law to write vector equations. A video with examples on Components of Vectors may be helpful. 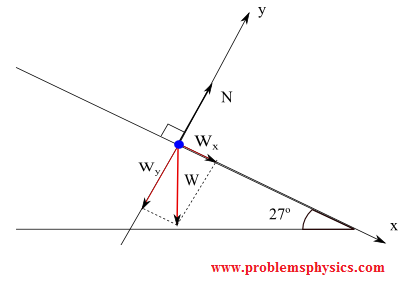 A 2 Kg box is put on the surface of an inclined plane at 27 ° with the horizontal. The surface of the inclined plane is assumed to be frictionless. 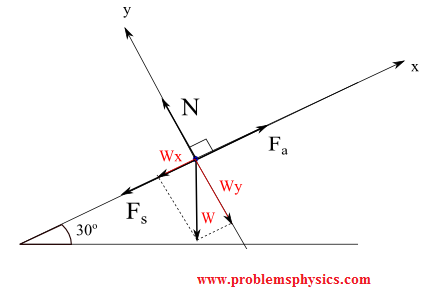 a) Draw a free body diagram of the box on the inclined plane and label all forces acting on the box. b) Determine the acceleration a of the box down the plane. c) Determine the magnitude of the force exerted by the inclined plane on the box. 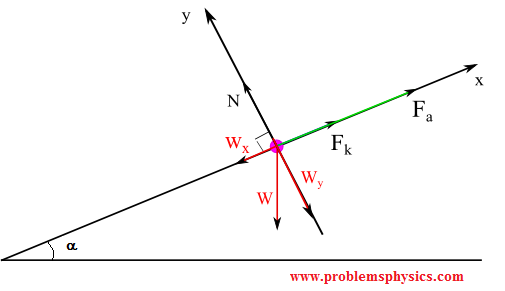 a = (ax , ay) = (|a| , 0) , box moving down the inclined plane in the direction of positive x hence ay = 0. A particle of mass 5 Kg rests on a 30° inclined plane with the horizontal. A force Fa of magnitude 30 N acts on the particle in the direction parallel and up the inclined plane. 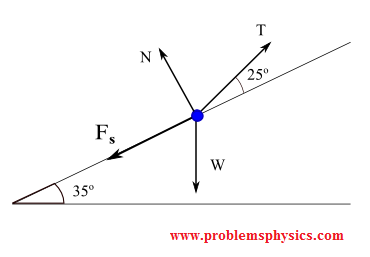 a) Draw a Free Body Diagram including the particle, the inclined plane and all forces acting on the particle with their labels. 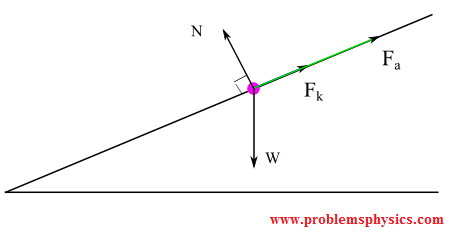 b) Find the force of friction acting on the particle. c) Find the normal force exerted by the inclined on the particle. The box is the small blue point. 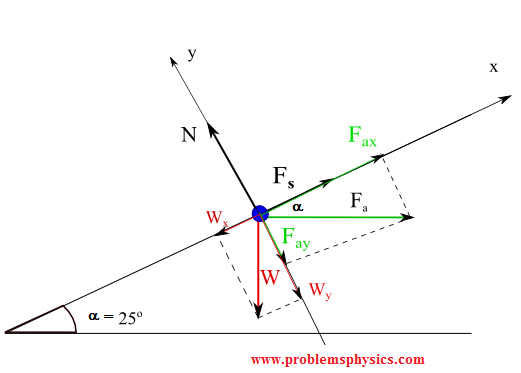 In the diagram below, W is the weight of the box, N the normal force exerted by the inclined plane on the box, Fa is the force applied to have the box in equilibrium and Fs the force of friction opposite Fa. 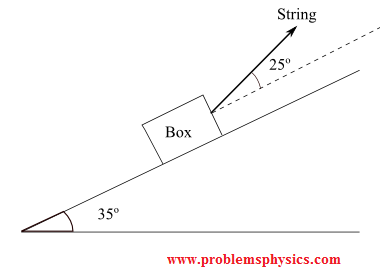 A box of mass M = 10 Kg rests on a 35° inclined plane with the horizontal. A string is used to keep the box in equilibrium. 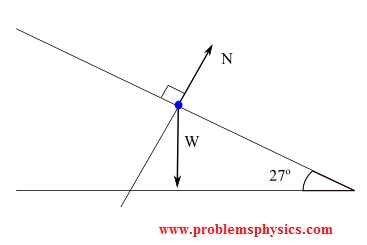 The string makes an angle of 25 ° with the inclined plane. 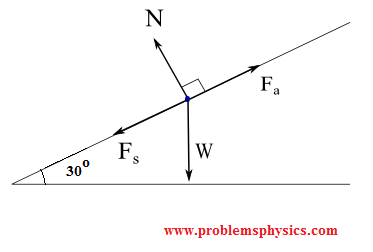 The coefficient of friction between the box and the inclined plane is 0.3.
a) Draw a Free Body Diagram including all forces acting on the particle with their labels. b) Find the magnitude of the tension T in the string. c) Find the magnitude of the force of friction acting on the particle. Forces and their components on the x-y system of axis. Fs = (- |Fs| , 0) = ( - μs |N| , 0) , where μs is the coefficient of friction between the box and the inclined plane. We now need to solve the system of two equations with two unknowns |T| and |N|. A 100 Kg box is to be lowered at constant speed down an inclined plane 4 meters long from the back of a lorry 2 meters above the ground. The coefficient of kinetic friction is equal to 0.45. What is the magnitude of the force Fa to be applied parallel to the inclined plane to hold back the box so that it is lowered at constant speed? forces acting on the box (purple point) and their components. W weight of the box, N the normal force exerted by the inclined plane on the box, Fa the applied force so that the box is lowered at constant speed and Fk kinetic force of friction (box is moving downward, force of friction opposite motion). 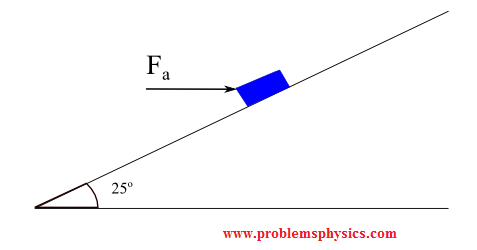 A box of mass M = 7 Kg is held at rest on a 25° inclined plane by force Fa acting horizontally as shown in the figure below. The box is on the point of sliding down the inclined plane. The static coefficient of friction between the box and the inclined plane is μs = 0.3. Find the magnitude of force Fa.